This image of Comet Lulin was taken before dawn on the morning of February 7. 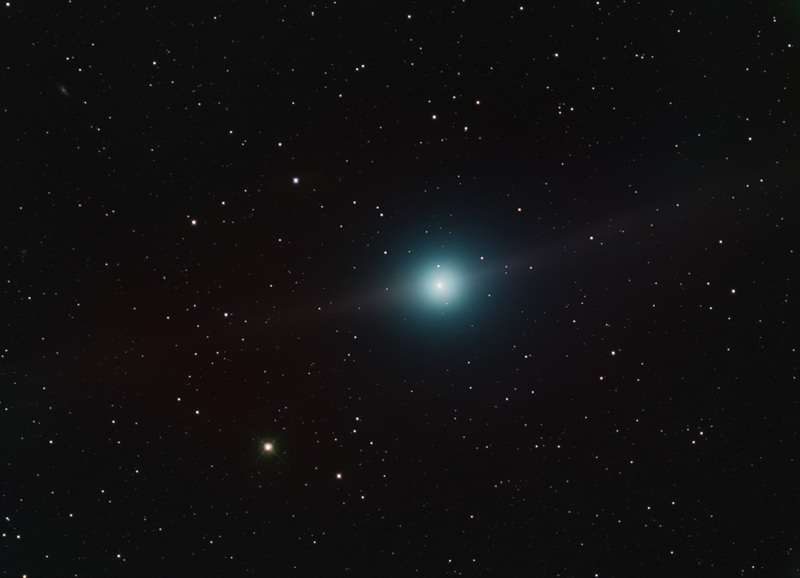 This comet displayed a rare view of an anti-tail, giving the comet the appearance of having two tails. This was a result of the unusual orbital geometry of the comet, so the the comet's dust tail was visible on one side, and the comet's ion tail was visible on the other side. I have a diagram showing why this comet appeared to have two tails. This comet had a retrograde parabolic orbit almost in the same plane as the ecliptic. The comet was in Libra and moving toward Virgo when this image was taken. The speed of the movement of the comet across our sky increased rapidly up through its closest passage by earth on February 24. The discovery of Comet Lulin is credited to two observers, one in mainland China, and the other in Taiwan. It was celebrated as a joint cooperative effort between the two countries. This image is a color composite RGB CCD image taken with an ST-8XE CCD using a Takahashi Epsilon 180ED telescope at f2.8. The image was taken from my backyard in Scottsdale, Arizona. This image was published in the 2010 Vatican Observatory Calendar. This image was featured in a story published by the St. Louis Beacon entitled, "Comet Lulin Makes a Unique Appearance." This image was also published in the photo gallery on the Anacortes Telescope & Wild Bird website. The image was used to illustrate a story in Ciência Hoje das Crianças, which is a magazine in Brazil that teaches science to children. The image was used by the Maynard F. Jordan Planetarium at the University of Maine.